Beautiful Ocean View!! Pelican Beach Resort! 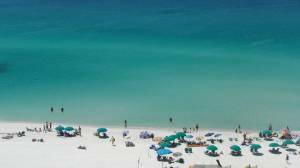 Located in the heart of Destin! 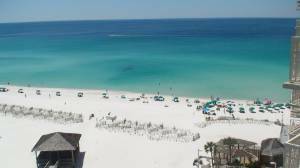 Gulf front 2BR 2BA condo, located on the 12th floor, with a gorgeous view of the world famous sugar white beaches and emerald green waters of the Gulf of Mexico. 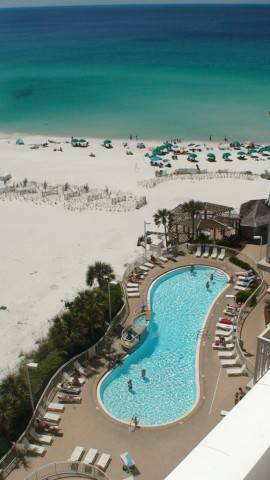 Pelican Beach Resort is one of Destin's most family friendly resorts. The resort has 3 pools. An Indoor/Outdoor Pool heated, Outdoor Pool with waterfall, Kiddie Pool, brand new Sun Deck with board walk to the beach, Tiki Bar (seasonal), Convenience Store, Spa and Fitness Center, Chair/Umbrella Beach Rental, Beach Front Hot Tub, BBQ Grills, Tennis Courts, Covered Parking, Security, Video Game Room, Conference Room that holds groups of 300 people and so much more. Chan's Market Cafe serves breakfast, lunch and dinner along with a Starbucks Coffee bar onsite (seasonal). During peak season the resort offers an onsite children's recreation program. Plus the Big Kahuna Water Park is right across the street from the resort! The living area and master bedroom open onto the 200 sq.ft. balcony overlooking the pools and Gulf south. Directly out the front door is a view of St. Martin Lake. The Master Bedroom opens onto the balcony and has a gulf view. 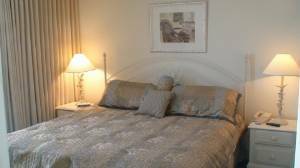 The Master also has a King size bed, candlewood furnishings, TV, ceiling fan and private bathroom. The bathroom is a tub/shower. 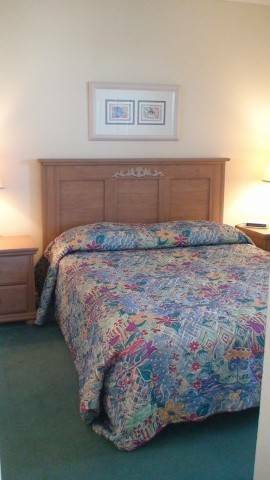 The Guest Room has queen bedding, TV with DVD Player and ceiling fan. The 2nd Bathroom is accessible from guestroom and living room. The bathroom has a standing shower. The Washer/Dryer closet is located in the guest bath. All linens and bath towels are provided. The sofa/sleeper opens up to a queen bed. Tile floor runs throughout the kitchen, dining room and living room. Carpet is in both bedrooms. High Speed internet access is available in our condo. It is not wireless. You have access to any of the amenities at The Terrace @ Pelican Beach as well when you stay at The Pelican Beach Resort. There are tons of unique shops and restaurants in Destin. Just to name a few, there is Silver Sands outlet mall and Destin Commons. 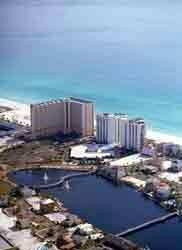 Destin Commons is about 1 mile from the resort. It has restaurants and many store such as Abercrombie & Fitch, Banana Republic, Build-A-Bear Workshop, Gymboree, Johnny Rockets, Panera Bread & Lucky Brand Jeans just to name a few. There is a Rave Motion Picture Theater and Big Bass Pro Shop located in the Commons. A few of the stores located at the Silver Sands outlet are Aeropostale, Baby Gap, Calvin Kline, Children's Place, Coach, Polo Ralph Lauren & Tommy Hilfiger. These are a few of the many stores for you to spend hours enjoying a day of shopping. We offer a 5% discount for repeat guests. We are the original owners of this unit. Our rates are guaranteed to be below the resorts and most private owners! 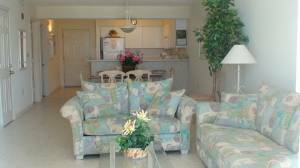 Come stay at our condo for a relaxing and fun vacation and leave the hustle and bustle behind. We often offer special rates. Please bookmark our listing and check back periodically. Specials are listed under the regular rates below in red. Big Kahuna Water Park is right across the street. New curtains and comforter. Opens up to balcony..New TV...King bed...carpet. Has private bath. New mattress April 2008. My family and I stayed here with a friend and her daughter in June of 2004. We LOVED the condo - it had everything we needed and then some! Very clean and nicely kept up. From now on, we will only stay at Pelican Beach resort - the indoor pool was great on a couple of rainy days, and the deli/store came in handy as well. Rented condo in Sept. of 2004. Great place, great condo, super location! 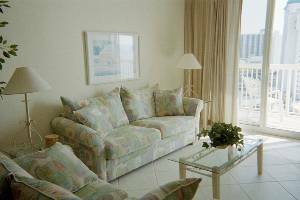 Our stay was cut short due to Hurricane Ivan... condo staff was extremely helpful and owners were easy to work with! Pelican Beach is our new favorite place to stay! Rates are seasonal and not guaranteed until reservation is confirmed. Deposit: $250 refundable security deposit. The check will be returned when unit is cleaned, checked and keys left behind. Cancellations and Refunds: Cancellation policy listed on reservation form. Per PBR Mgmt Policies, we can not rent to singles under 25 without parent/guardian.